Do you need any specific time off work? I certify that the information on this application is complete, true, and correct. I also authorize KNUCKLEHEADS to check the references and statements on this application, agree to cooperate with such an investigation and release it and anyone furnishing information from all liability or damage to me related to the information provided. I also understand that misrepresenting or omission of information asked for in this application may disqualify my consideration for employment or result in immediate termination if I am hired. I understand that job offers may be contingent on successfully passing a physical examination and/or drug screen. I also understand that I may be required to sign a Confidentiality and/or Non-compete Agreement as a condition to employment. 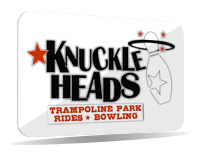 I further understand that KNUCKLEHEADS is an "at-will" employer; that means either I or KNUCKLEHEADS may terminate the employment relationship, with or without notice, for any reason or no reason at any time. The at-will relationship may not be modified by oral or written statements by anyone at the KNUCKLEHEADS, except by the president acting through a signed written agreement. Submission/receipt of an application does not mean that KNUCKLEHEADS currently has a job position available. Applications are considered active only if there is a job opening and only during the period until the job opening for which the application was submitted has been filled. KNUCKLEHEADS will consider all applications without discrimination on any basis prohibited by law and is an equal opportunity employer.